When it comes to beauty gadgets, I must admit that I am a bit old school. I rarely dabble with them. I struggle to get into the habit of using them, and then even when I do, when they finally run out of charge, they then go weeks/months without being used. Therefore, I am a bit sceptical, but only because of my lack of discipline. 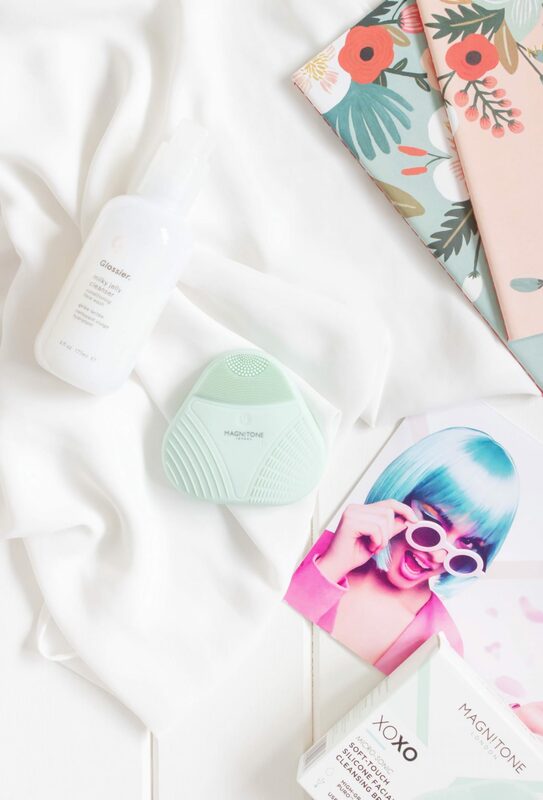 Recently I was kindly sent the Magnitone XOXO Cleansing Brush* to consider, whereby over several weeks I have pulled together my conclusions. This product intrigued me as it was different to anything that I had personally tried before. First and foremost, it is plastic silicone brush, it doesn’t have any traditional bristles like, for instance, the No7 Cleansing Brush from way back when. (I never got around to trying a Clarisonic, although I believe the principal was the same). The Magnitone XOXO Cleansing Brush is a lightweight, re-chargeable cleansing brush with three different antibacterial zones for different skin types as you can see below. It is also sensitive skin friendly which is an added bonus. Whilst my skin isn’t sensitive as such, it is prone to going red during cleansing. Even last week, I did have somewhat of a reaction to a product, it was completely unrelated to this. I believe an out of date face mask was to blame; oops. However, I digress, although this does go to show at any point one can have a reaction, even if it is their own fault. 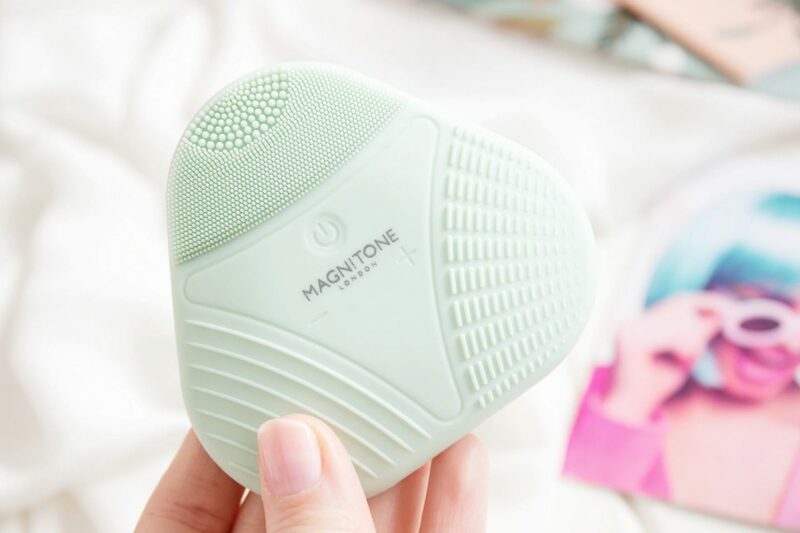 The Magnitone XOXO Cleansing Brush aims to cleanse the skin gently helping to soften and promote clear skin by tackling blemishes and helping to control excess oil on the skin. The micro sonic technology behind this promotes 8000 pulsations per minute, stimulating and massaging the skins surface and helping to unblock pores. You can change the speed of the brush by pushing the negative/plus symbols respectively. This either increases or slows down the device depending on what you opt for. This is also waterproof, although I am still a bit paranoid about the back of it getting wet as this is where the USB charge port is, although granted, there is a little cover that pops off protecting the port itself. My ultimate thoughts on this are mixed. I love the idea and the concept behind this. I like the three different textured zones and find that overall this work well on my skin type (combination). I don’t stick to a specific textured zone, in fact, I use any one of them and can’t really say in truth that I have personally noticed any difference between them. To date I have only used this with a gel cleanser, my choice at the moment is the Glossier Milky Jelly Cleanser and overall it works. My skin feels like it has had a little old work out when I have used this, it tingles (not in a bad way) although I do feel as though I haven’t been able to work the product into my skin as well as I would like. I find that the reason for this is because the tool itself doesn’t bend, it is a sturdy thing and therefore, you are unable to manipulate the device into the shape of your face, whereas when using your hands and flannel, this is straightforward. To me I feel as though having used this, I still want to go in and cleanse my skin again with my hands and flannel as only that way I truly feel as though I have cleansed my skin properly. Perhaps, given the above, this product is more suitable for me to use of a morning time. Ultimately, I am on the fence. I am extremely grateful to have had the chance to use this and I am going to continue testing it out and seeing if I can find a better way to make it work for me. I would love to hear your thoughts on this and if you have tried it in the past what you ultimately thought. Have you perhaps tried something similar? The Magnitone XOXO Cleansing Brush retails at £40 and can be purchased from Magnitone, Look Fantastic and Mankind.